To assist the environmental engagement of staff, pupils and others. Package including a report and 17 sketches. Oundle School dates back to 1556 when Lord Mayor of London Sir William Laxton endowed and re-founded the original Oundle Grammar School, of which he was a former pupil. Early in the 20th century, Oundle gained a reputation for science and engineering which has continued to this day with the development of SciTec, a major new science complex. As new and growing 21st century issues increasingly come to the fore, we were delighted to receive an enquiry about whether we could help with the engagement of staff, pupils and others to reduce environmental impacts and, potentially, utility bills too. This provided us with an opportunity to test how we could offer real value within the bounds of a limited budget. Working with just five annual figures from the School – gas, electricity and water use, waste to landfill and the School population, we were able to provide a bespoke package. Our illustrated report Ways of seeing Oundle’s impact sets out calculations, reference sources, coefficients and assumptions, a compendium of facts, some surprising and memorable examples of energy equivalence and answers to a set of FAQs. Seventeen accurate volumetric sketches show emissions and water use over periods from a second to a year. We got boarding house consumption of electricity down by 21% in March, and I am sure that a large part of that was through the visualisation, report and sketches. The materials have been used in a variety of ways in outreach, training for service providers, posters and in classes with changes in behaviour starting to be noticed straight away and helping Oundle School move forward on the path towards environmental sustainability. Carbon Visuals was asked by the Soil Association to provide a set of simple 3D image ‘sketches’ to show the carbon saving that can be achieved by using low carbon farming practices. The sketches are being used to help UK farmers have a better understanding of what would otherwise be meaningless numbers. The Carbon Majors report, launched November 2013, is accompanied by striking graphics from Carbon Visuals which show the extent to which corporations are responsible for the cumulative emissions causing climate change. Key information from a huge array of data has been conveyed by Carbon Visuals in both conventional and novel ways to give a feel for the scale of the cumulative emissions involved. The Environmental Defense Fund asked us to explain the difference between gasoline from tar-sands and regular gasoline in terms everyone can relate to. We compared them in terms of a single gallon of gas and a typical car's annual emissions. Carbon Visuals has created an image to illustrate the energy saving of the highly insulated Coati House at Paignton Zoo. The sustainable building uses recycled plastic, green oak sleepers, FSC timber and 150mm thick black mountain sheep wool insulation so that heating is not required. Without this insulation the zoo would have installed a 4kW electric heater. 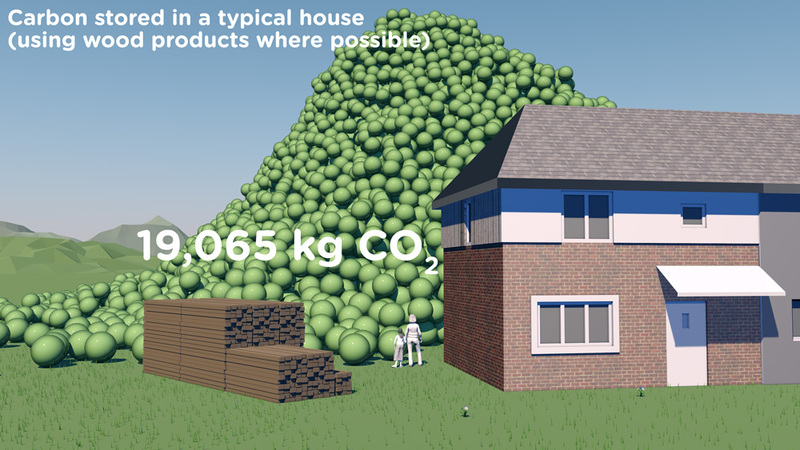 The image shows the actual volume of CO₂ that would have been emitted every day or every hour by such a heater. Paignton Zoo Environmental Park, is a combined zoo and botanic garden in the South West of England that welcomes over half a million visitors a year. In November and December 2012, Bill McKibben and 350.org's Do the Math Tour was a massive success, with sold out shows across the United States. 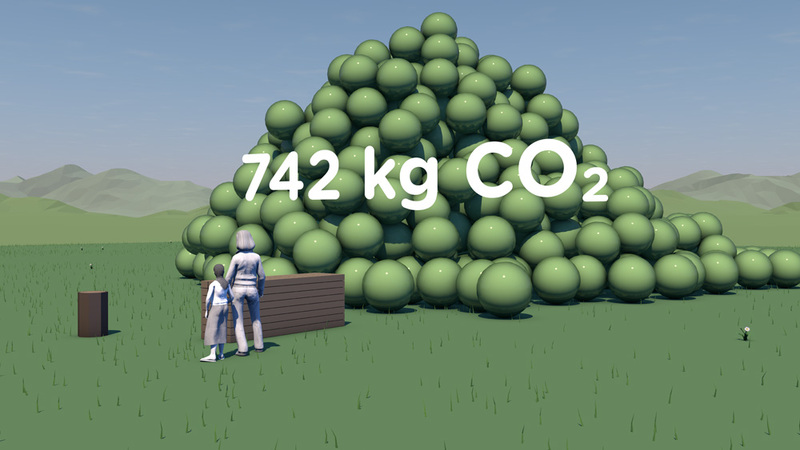 Carbon Visuals supported the tour by making the numerical argument visual - showing the actual volume of carbon dioxide gas represented by the numbers in the 'Do the math' argument. Seventy five percent of New York City's greenhouse gas emissions come from the energy used by buildings. Reducing this energy is a goal of both building managers and the City of New York itself. 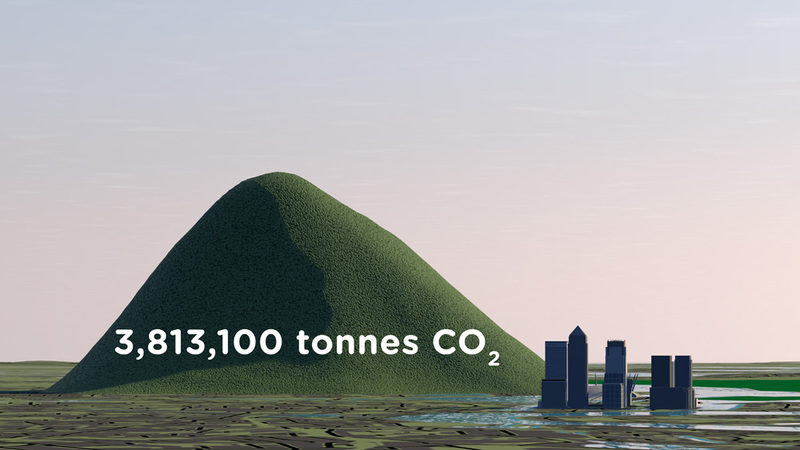 This visualisation takes data about the carbon emissions of municipal buildings in New York City and transforms it into a 3D map of the actual volume of carbon dioxide added to the atmosphere. It co-opts the city itself to serve as its own data visualisation. One set that we thought would benefit from ‘becoming visible’ was the eGRID data collated by the US EPA. This gives annual generation and environmental characteristics of all large electric power generators in the US. 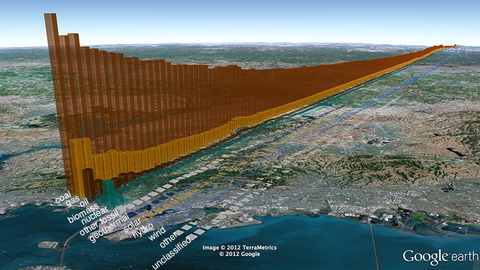 A view showing the actual annual volume of CO2 produced by power stations around Chicago. Emissions from power stations have been grouped by category and placed in order of size, making the biggest ever bar-chart in the process. The bases of the columns have dimensions 2,578 x 2,578 feet. A view from Florida with 574 x 574 feet columns. Narrower volumes do not give such a clear sense of volume, but they have the advantage of indicating the distribution of power stations more clearly. By using our Google Earth Visualiser tool we are able to create images for any location in the US that show nearby power stations and associated data. If you would like to explore this data using Google Earth you can download the KMZ file here. Showing the emissions of power stations in this way is experimental, and a first step. We would welcome ideas and proposals on how this could be developed. If you have collaboration or funding ideas please contact Carbon Visuals CEO Antony Turner. ModCell is a novel and innovative building system that brings the benefit of straw bale construction - exceptional levels of insulation - into the mainstream of the construction industry. Carbon Visuals was asked to provide images to show the sequestered carbon dioxide in panels and in a recently completed project - a school science centre in Bath. 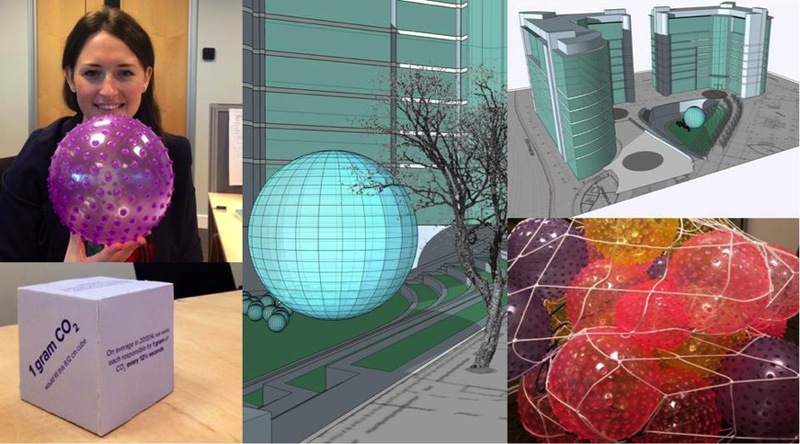 The Building Confidence Project emerged from an energy 'data-jam' at the Google offices in New York to which Carbon Visuals was invited. It was organised by the White House to generate new approaches to energy efficiency. The project idea, facilitated by Honest Buildings, was to create a database of energy efficiency projects that can inspire and facilitate similar initiatives elsewhere. Carbon Visuals' role was to consider the role data-graphics could play in reaching wider audiences. Barts Health NHS Trust was formed in 2012. It is the largest in the country with multiple sites and major projects planned and underway. 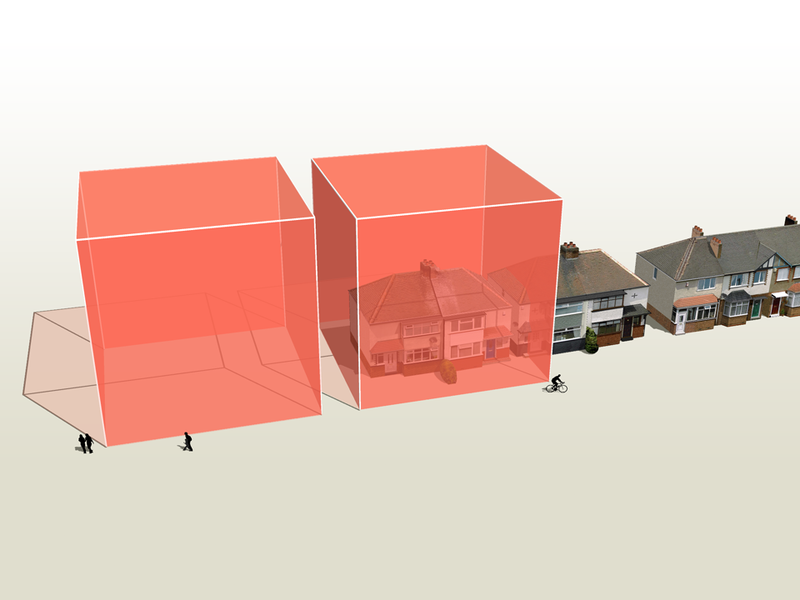 For presentation of the Estate Strategy we created 3D models and a map=based animation that showed, in simplified form, development and other planned changes over a five-year period, together with data for water, gas and electricity usage. We also provided a set of images for use in other presentation formats and media. Adam Nieman has created a series of images as part of a residency at the Create Centre, Bristol, April-June 2012. The exhibition coincided with Bristol's Big Green Week, an annual event that engages the public in green issues and actions. 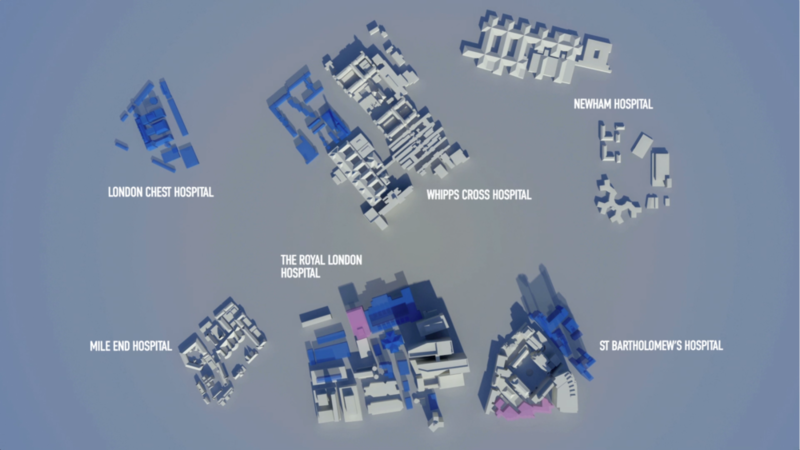 Carbon Visuals was commissioned by UCLH (University College London Hospital), to create a set of images showing the emissions associated with the energy use amongst the diverse buildings that make up the Trust's estate. 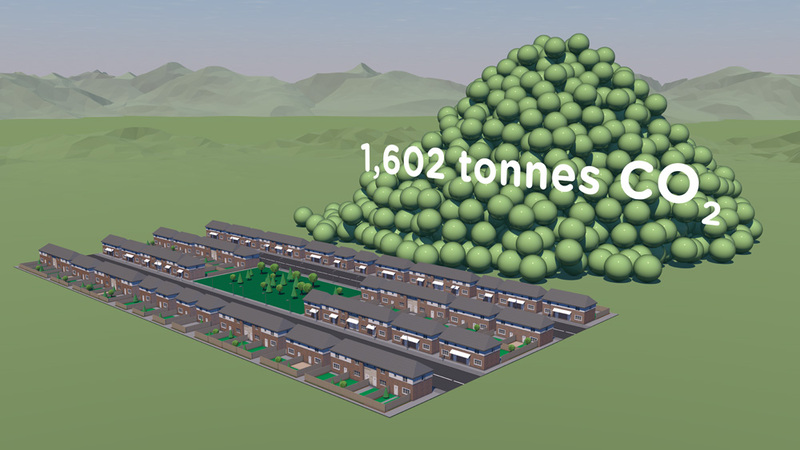 Carbon Visuals was invited to provide a set of images to illustrate the daily and annual carbon footprint of greenhouse gas emissions from selected buildings on the University of Plymouth campus. Contributions to 2009/10 emissions from individual institutions. Adoption of the Carbon Reduction Masterplan will prevent 2,303,047 tonnes of carbon dioxide entering the atmosphere between now and 2050. 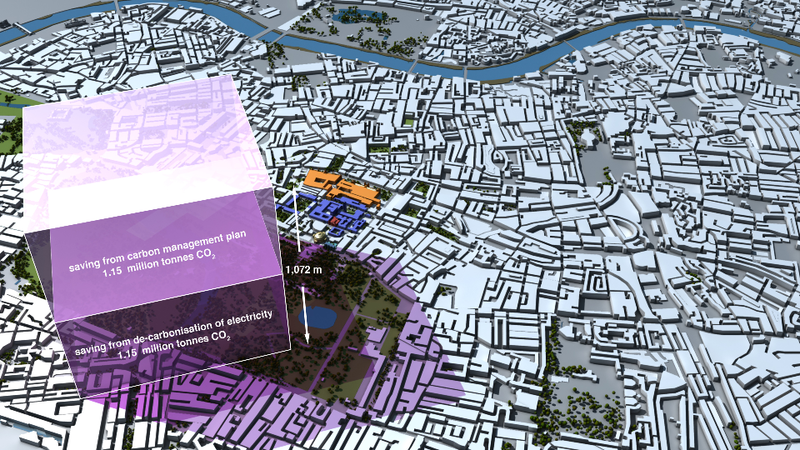 To illustrate the carbon reduction potential for the South Kensington 1851 Estate. Striking image set, to illustrate the Carbon Reduction Masterplan launched by the Minister of State for Energy and Climate Change. Carbon Visuals has created a set of striking images to illustrate the carbon reduction potential for the South Kensington 1851 Estate. Organisations involved include the Natural History Museum, the Science Museum, the Victoria and Albert Museum, Imperial College, the Royal Albert Hall, the Royal College of Music and the Royal College of Arts. These prestigious institutions came together in 2005 to embark on an inspirational long-term carbon reduction plan. Phase One involved laying the foundations and creating a realistic strategy. 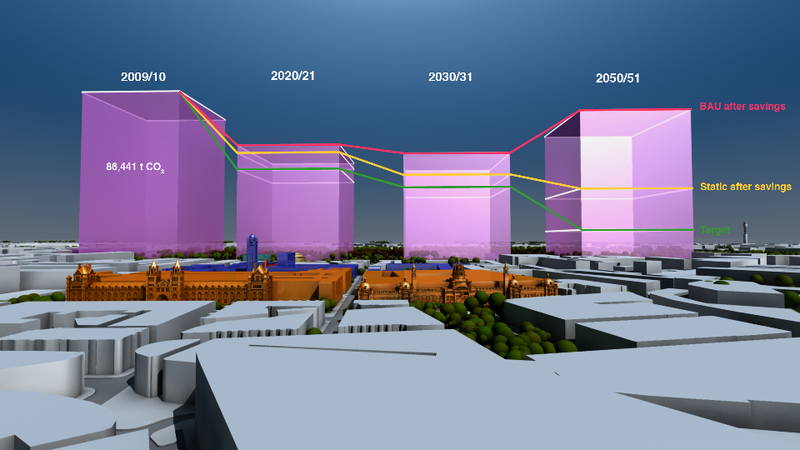 The Masterplan, launched in November 2011, marks the conclusion of that phase and the commencement of its realisation. Carbon Visuals aided communication amongst the parties and with external stakeholders by creating striking imagese at various stages of the project. 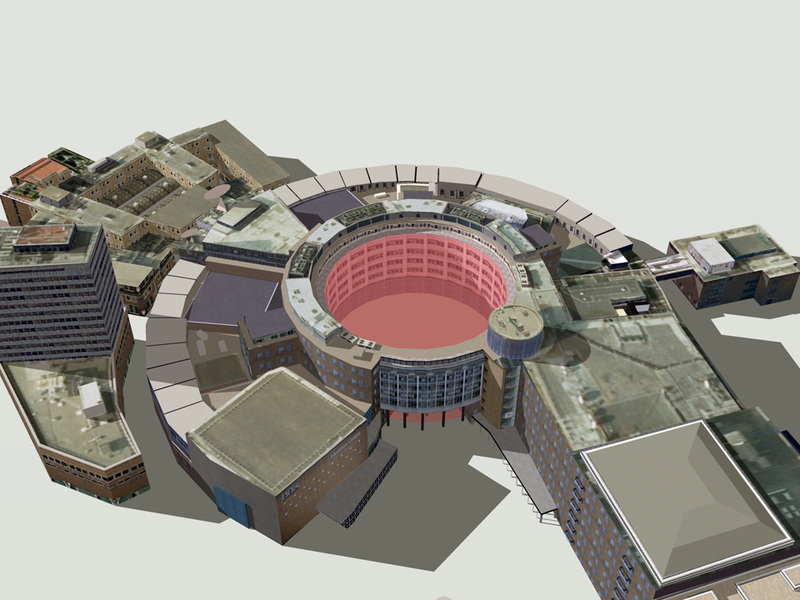 Creating a computer generated model of the Estate enabled a wide range of different images to be created - wide angle, close-up, aerial and ground level. To see the context in which the images were used feel free to download the PDF of the overview brochure.